Sometimes a fabulous dish comes out of an epic failure. On Father’s Day this year, since we didn’t have any of our kids with us, I was going to make homemade ricotta cheese and use that to make ravioli for my pasta-loving husband. As I was stirring the hot half-and-half mixture it occurred to me I had used ultra-pasteurized dairy, which would never turn into curds. So I quickly shifted gears, not wanting to waste the 3 cups of half-and-half, and I turned it into a béchamel sauce. 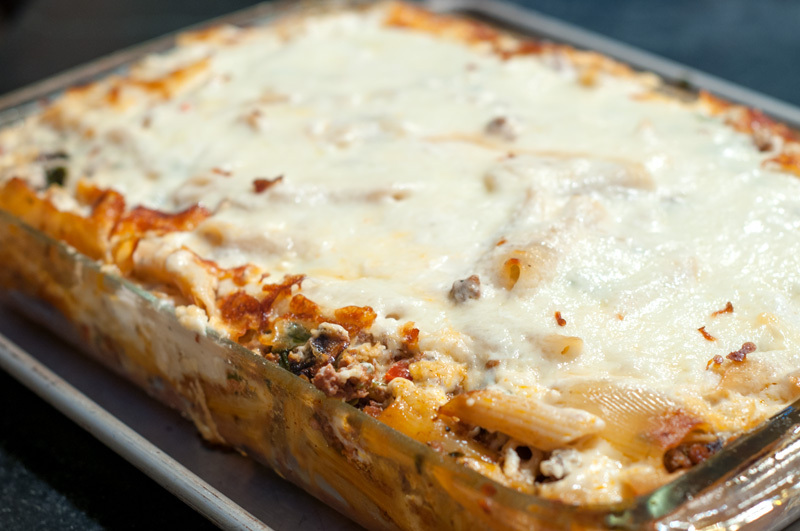 I stared at it for a few minutes, googled “baked pasta with béchamel” and found this recipe, and I was off and cooking! 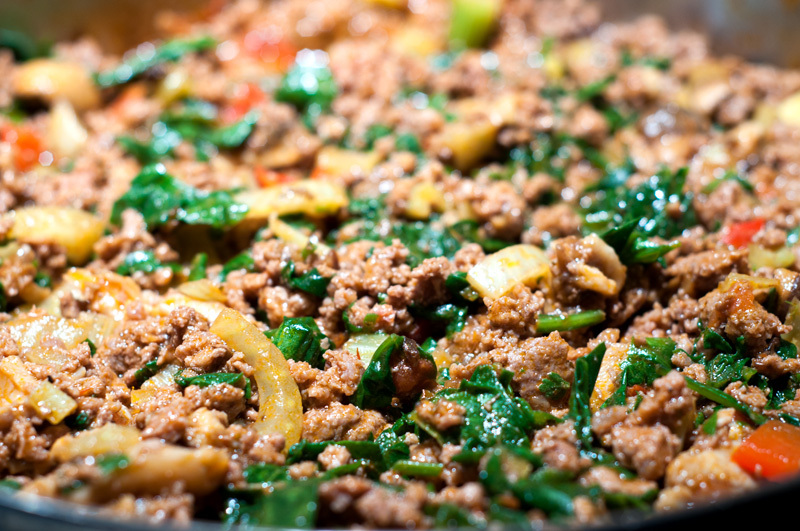 You can add whatever vegetables you like to this dish, or just use meat if you want. I like to do a roundup in the crisper draw when making a dish like this so I found 3 small fennel bulbs and 8 ounces of fresh Hazel Dell mushrooms I had purchased at the farmer’s market that needed to be used. There was also some leftover cooked spinach and about a half of a red pepper that needed to go. All in all that was about 3-4 cups of chopped vegetables before cooking. Set the pasta water to boil while you sauté the vegetables in a bit of oil until soft. Remove them to a large bowl, and brown the meat in the same pan while you are cooking the pasta in the boiling water. 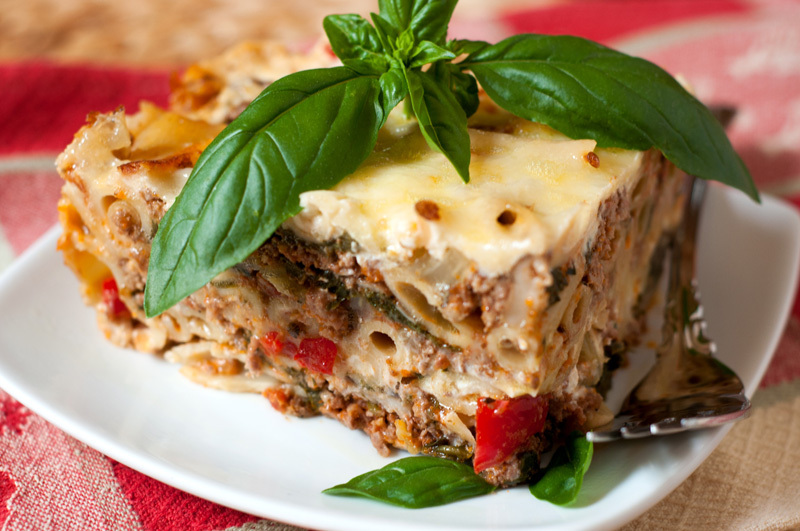 Stir everything together – the semi-cooked pasta, the sautéed vegetables, and the browned meat. Pour half into a casserole dish, spread half the béchamel over the top, and sprinkle half the cheese. Repeat with the remaining pasta mixture, béchamel and cheese. Cover and bake until bubbly, about 45 minutes, and then let stand 10-20 minutes before cutting into the casserole so that it holds its shape. I actually cut a piece of the leftover cold casserole for this photo, so don’t expect it to hold together this tightly. But if you like to freeze portions for another meal like I do, then cover and refrigerate overnight before cutting into portions and wrapping tightly in plastic wrap. 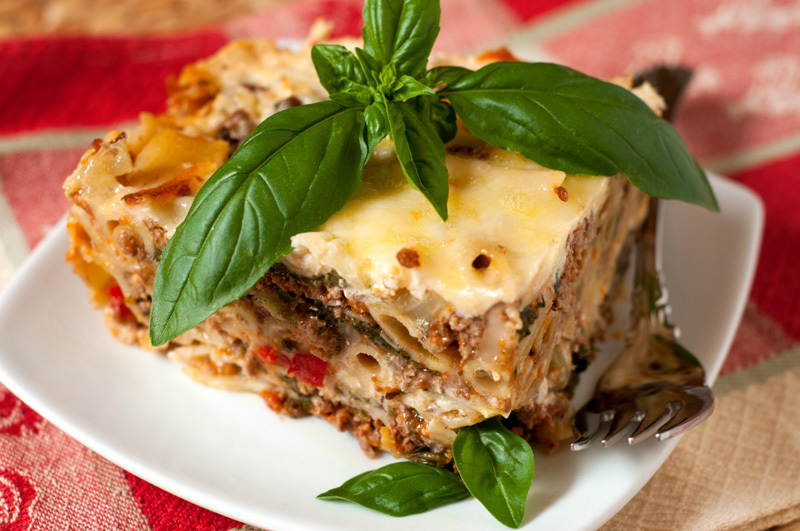 We both loved this dish – the addition of béchamel as is traditional in lasagna from the Bologna region of Italy makes it decidedly richer and more decadent. And what could possibly be wrong with that?! Heat the olive oil and flour over medium high heat for a couple of minutes, then slowly whisk in the half and half a little at a time until it is incorporated and smooth. Remove from the heat and season with salt and pepper; set aside. Heat 1-2 tablespoons of oil in a large skillet over medium high heat and add the fennel, pepper, and mushrooms. Cook until the moisture from the mushrooms is released and has evaporated, about 10 minutes. Remove vegetables to a large bowl. Add the beef to the same skillet and cook until browned. Add the meat to the vegetables along with the marinara, spinach, and cooked pasta. Toss to combine. Spray a 13 x 9 x 2 inch casserole dish with cooking spray and pour half of the pasts mixture into the dish. Spoon half of the béchamel sauce over the mixture, and sprinkle with half of the mozzarella. Repeat layers one more time, over with foil, and bake at 375 degrees until bubbly, about 45 minutes. Let stand 10-20 minutes before serving. Ten Things You Should Make From Scratch…and Why!